Two-color houndstooth plaid pattern with a great feather boa I found at Hancock Fabrics for only $2.99, and I have a lot of the feathers left over!!! I already tested the boa in water to see if it is at all washable and it didn't seem to affect it much. 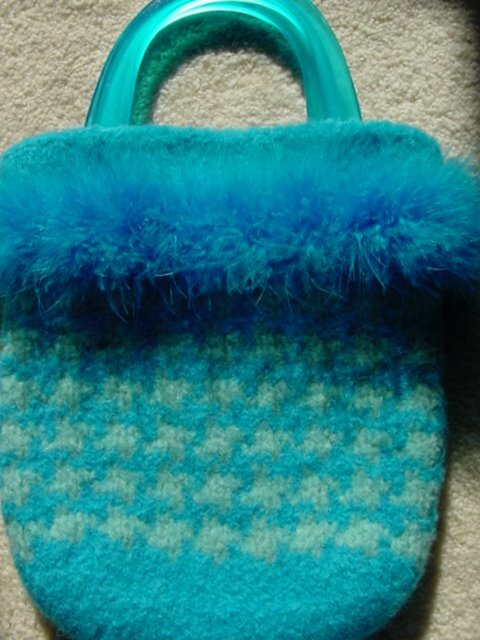 The bag is from Noni's Bags pattern for the evening bags. It is not currently lined since I was unable to find a suitable fabric on my first try. It measures a little larger than 8" x 10" after felting.